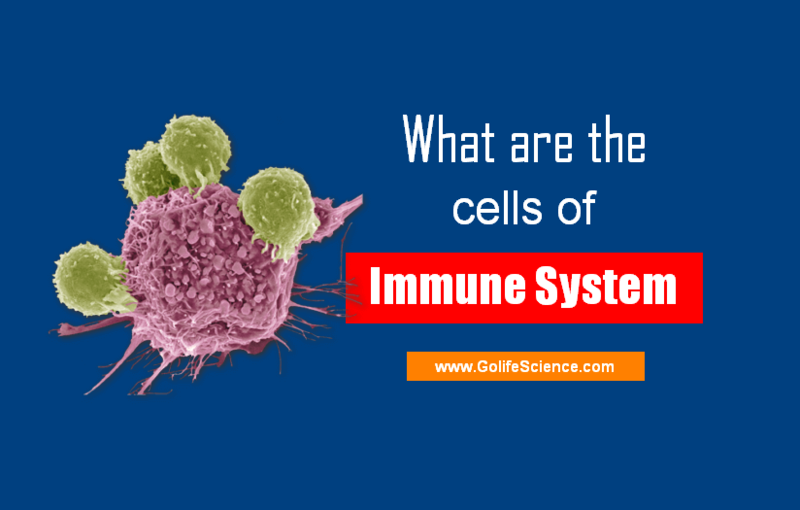 Cells of Immune System: What are the basic Immune Cells? Lymphocytes are the central cells of the immune system, responsible for acquired immunity & the immunologic attributes of diversity, specificity, many and self/non-self recognition. It constitutes 20% to 40% of the body’s WBC and 99% of the cells in the lymph. The lymphocytes can be broadly subdivided into three populations – B-cells, T-cells, Null cells on the basis of function and cell membrane components. Resting B & T-lymphocytes are small, motile, nonphagocytic cells, which can’t be distinguished morphologically. In Go – phase of the cell cycle, B, and T- lymphocytes are not interacted with antigen-referred to as “naive cells”, which have generally short life span. Certain cytokines induce the naive cells to enter the cell cycle by progressing from G0 into G1 & subsequently into S, G2 & M.
Lymphoblasts proliferate and differentiate into “Effector cells” (or) into “Memory cells”. Effector Cells: The functions in various ways to estimate the antigen. These cells have short life spans, generally ranging from a few days to a few weeks. Plasma Cells: The antibody-secreting effector cells of the B-cell lineage have a characteristic cytoplasm that contains abundant ER (to support their rate of protein synthesis). The basic cells of immune system are Lymphocytes (B-Cells and T-Cells), Mast cells, Granulocytes, and NK cells. The letter “B” designate from its site of maturation, in the “Bursa of Fabricius” in the birds; and “Bone marrow” in the mammalian species, including humans & mice. B-Lymphocytes carries out “Humoral-immune response” by producing antibodies. B-Lymphocytes is stimulated by “Th -lymphocytes”. When the antigen stimulates, the B-cell divides repeatedly & differentiate over a 4 to 5 day period, generating a population of plasma cells & memory cells. Plasma cells lack membrane-bound antibody, synthesize and secrete one of the five classes of antibody. Each of the approximately 1.5X105 molecules of antibody on the membrane of a single B- cell has an identical binding site for antigen. B-cell differentiation as assessed by membrane immunoglobulin expression can be divided into antigen-independent and antigen-dependent phases. Surrounding microenvironment influences of the bone marrow i.e. drives antigen-independent differentiation of B-cells: B-cells develop “Clonal diversity” in the absence of antibody receptors for antigens. by stromal cell-derived growth factors in later stages of B-cell development. Progenitor B-cells use their molecules to bind to stromal cell “Hyaluronic acid“. This activity promotes “C-kit ligand” (Stem Cell factor) binding to C-kit encoded “Tyrosine kinase” membrane receptors. B-lymphocyte differentiates from stem cells to pre-progenitor B-cells undergoing heavy V-region gene rearrangements, and then to progenitor B-cell that contain “Cytoplasmic -n-Chains“. In the next stage, pre-B-cells undergo light chain V-J-arrangement and express low levels of membrane n-heavy chains associated with surrogate light chains. These surrogate light chains associate with each other to form a “light chain like structure“. At this time, the immature B-cells express both n-heavy chains and light chains as surface Ig.M molecules. Finally, the B-cells also start to express Ig.D in addition to Ig.M. These cells are called “Mature B-cells“, and exit to the periphery. 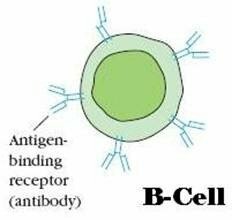 Focus point: Once stimulated antigen, the B-cells lose Ig.D immunoglobulins A portion of the cells becomes a memory cell. B-cells then progress into plasma cells that secrete the class of Immunoglobulin lost represented on their surfaces. T-cells regulate the “Cell-mediated immunity“. The cells operate against cells bearing intracellular organisms, T-cells recognize antigen only when it is on the surface of body cells. T-cells have receptors on their membrane surface (cell markers), which belongs to an important group of molecules known as the “Major Histocompatibility Complex (MHC)”. There are 4 types of t-lymphocytes are present in the immune system. It is one of the important cells of immune system. The TH-cells recognize and bind to the combination of the antigen with the class -II MHC on the macrophage surface. TH-cells produce a variety of soluble factors known as “Cytokines“. The cytokines induce gamma-interferon” and other Macrophage activating factors“. The cytokines restore the microbicidal mechanism of the macrophage and bring about the death of the intracellular microorganisms. The cells clonally express a large number of different surface receptors. Each Tc recognizes antigen only association with a cell marker, the class-l MHC. The cells recognize virally infected cells, which are killed before the virus replicates. Like B-cells, Tc – cells require help from Th-cells. These cells attack infected cells and cancer cells. The cells discharge a protein called “Perforin“, which lyses the infected cell. The Ts-cells promote an immune response. The cells suppress a specific antibody formation (Infectious tolerance). The “Infectious tolerance” phenomenon was shown that mice could be made unresponsive by infection of a heavy dose of sheep RBC into them; their T-cells suppressed specific antibody formation in the recipient mice. Ts cells are a subpopulation of T cells that suppress the activity of B-cells and other T-cells. They are the regulatory T cells. They inhibit antibody production by B cells. They suppress the functions of the T killer cells and T-helper cells. The T-cell receptor was elucidated through the powerful recombinant DMA technology. The T-cell receptor called “Ti” (which is a made up of two non-identical polypeptides- α & β chains and joined by a disulfide bond). The Ti associated with another protein called “CD3”. After many years, the immunologists identified the second type of receptor composed of gamma and 6-chains. The CDs is made up of at least three polypeptide chains (γ,δ, and Є). 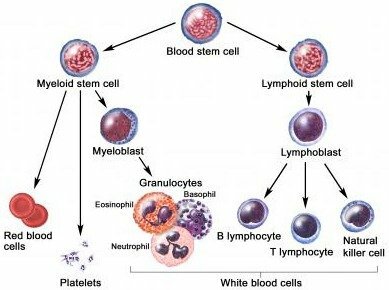 The T-lymphocytes are derived from “Hemopoietic stem cells” of bone marrow. Some of these cells turn into “Lymphopoietic progenitor“. The lymphoid progenitor cells turn into “Pre-T-lymphocytes“. The Pre-T-cells leave the bone marrow and enter the thymus. In the thymus, they mature into T-lymphocytes through the influence of thymic hormones. The mature T-lymphocytes enter the blood and colonies the secondary lymphoid organs such as the spleen, lymph nodes, payer’s patches, etc. Here they become functional on exposure to antigens. Macrophages are phagocytic cells, derived from the blood monocyte. Macrophages are part of the innate immunity. Macrophages are the general antigen-presenting cells. The Macrophages are amoeboid cells and having nucleus & prominent cytoplasmic lysosomes. Macrophages are very important cells of immune system. Macrophages like cells serve different functions in different tissues & are named according to their tissue location. Mononuclear phagocytic cell – monocyte circulating in the blood up to 8 hours, during which time they enlarge; they then migrate into the tissues & differentiate into specific tissue Macrophages and “ϒ-interferon”(ϒ-IFN) secreted by activated TH-cells. Antimicrobial! & cytotoxic substances produced by activated macrophages can destroy phagocytosed microorganisms. Activated phagocytes produce a number of “Reactive Oxygen Intermediates (ROIs)” & “Reactive Nitrogen Intermediates” that have potent antimicrobial activity. During phagocytosis, a metabolic process known as the “Respiratory Burst” occurs in activated macrophages. As the lysosomes fuse with the phagosomes, the activity of “Myeloperoxidase” produces hypochlorite from hydrogen peroxide and chloride ions. Hypochlorite, the active agent of household bleach, is toxic to ingested microbes. When the macrophages are activated with bacterial cell wall components. The T-cell-derived cytokine (IFN-γ), they begin to express high levels of “Nitric Oxide synthetase“(NOS), an enzyme that oxidizes L-arginine to yield L-Citrulline & nitric oxide (NO), a gas. No has potent antimicrobial activity. Activated macrophages also synthesize ‘lysozyme’ and various hydrolytic enzymes whose degradative activities do not require Oxygen. The activated macrophages produce a group of anti­microbials cytotoxic peptides, commonly known as “Defensin“, these Molecules are cystine-rich cationic peptides containing 29-35 Amino acids residues. The defensin is circularized protein. The peptide form ion-permeable channel in the bacterial cell membrane. Some intracellular pathogens prevent the fusion of lysosomes with phagosome and proliferate within phagosomes. Granulocytes are a type of White Blood cells. These cells are considered as Body soldiers. 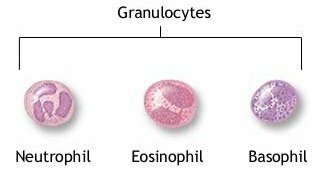 The granulocytes are classified as Neutrophils, Eosinophils and Basophils on the basis of cellular morphology and cytoplasmic staining characteristics. It has a multilobed nucleus & granulated cytoplasm that stains with both acid & basic dyes. These are produced by hematopoiesis in the bone marrow, which is released into the tissues, where they have a life span of only a few days. Movement of circulating neutrophils into tissues called “Extravasation“. Both primary & secondary granules are fuse with phagosomes. The cells exhibit a larger “Respiratory Burst” than macrophages & express higher levels of “defensins” than macrophages do. The cells are motile phagocytic cells that can migrate from the blood into the tissue spaces. It has a bi-lobes nucleus & a granulated cytoplasm that stains with the acid dye “Eosin” red (hence its name). Play a significant role like a phagocytic role like macrophages. The secreted contents of eosinophilic granules may damage the parasite membrane. It has a lobed nucleus and heavily granulated cytoplasm that stains with the basic dye “Methylene Blue“. These are nonphagocytic granulocytes, which release pharmacologically active substances from their cytoplasmic granules. These substances play a major role in certain “Allergic responses“. These cell precursors are formed in the bone marrow by hematopoiesis. Connective tissues of various organs, the Mucosal epithelial tissue of respiratory, Genitourinary & digestive tracts. These cells have a large number of cytoplasmic granules that contain “Histamine” and other pharmacologically active Substances. It plays an important role in the development of allergies. Many forms of cutaneous and mucosal allergy are mediated for a large part by mast cells; they play a central role in asthma, eczema, itch (from various causes) and allergic rhinitis and allergic conjunctivitis. Antihistamine drugs act by blocking the action of histamine on nerve endings. Cromoglicate-based drugs (sodium cromoglycate, nedocromil) block a calcium channel essential for mast cell degranulation, stabilizing the cell and preventing the release of histamine and related mediators. Leukotriene antagonists (such as montelukast and zafirlukast) block the action of leukotriene mediators and are being used increasingly in allergic diseases. Mastocytosis is a rare condition featuring the proliferation of mast cells. It exists in a cutaneous and systemic form, with the former being limited to the skin and the latter involving multiple organs. Mast cell tumors are often seen in dogs and cats. Null cells are lymphocytes with cytotoxic properties. They are neither B-cells T cell. They are intermediate between T and B cells. They form less than 3%. There are two types of Null cells namely, Natural Killer Cells (NK cells) and Killer Cells. NK cells are a group of null cells. They form the third population of lymphocytes. The NK cells have 2 or 3 large granules in the cytoplasm. Hence they are also Large Granular Lymphocytes (LGL). They have a kidney-shaped nucleus. The NK cells kill the target cells without the aid of an antibody or complement. So they are antibody-independent. They destroy the cancer cells and cells infected with herpes and mumps virus. They are activated by Interferons and Interleukins-2. Killer cells are antibody dependent. These cells possess Fc receptors for binding with IgG antibodies. Hence they can bind with cells coated with IgG antibodies and can kill them. These cells can combine with a specific antibody when it is in a complex with antigen. If the complex is on the surface of a target cell, these lymphocytes become activated destroying the target cell. This cell can kill a variety of cells such as tumor cells, bacteria, viruses, fungi, and parasites.